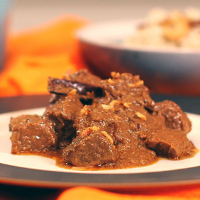 This is sweet, rich, spiced and lightly coconutty, but the star is the meltingly soft beef. This slightly Indianised version of the South-east Asian classic is easy and needs little more than 20 minutes of your attention. It works really well; in fact so well that I promise you will crave this dish. Serve it with rice. 1 Preheat the oven to 180°C/350°F/gas mark 4. 3 Heat the oil in a medium-large ovenproof saucepan. Add the whole spices and follow with the spice paste, cooking until all the excess liquid has dried up. Stir-fry the paste for five to seven minutes. If it threatens to burn, add a splash of water. 4 Add the beef and onions and cook for another three to five minutes in the paste, stirring often, or until all the beef has some colour. Add the coconut milk, lime zest, palm sugar and the whole bruised lemon grass stalks. Bring to a boil, then cover the pan and transfer to the oven. Cook for 11⁄2 hours, or until the beef is meltingly soft. Check halfway through, stirring in any browned bits on the edges. 5 When done, replace the pot on the hob and stir in the tamarind paste, creamed coconut and garam masala. Taste and adjust the seasoning, also adding the lime juice to taste. Serve hot. This recipe was first published in Thu Aug 28 16:40:56 BST 2014.